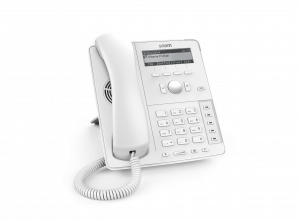 Earlier in the year, we teased an exciting new addition to the Snom family, white IP Phones (brownie points to those who remember). And now at the tail end of the year, we’re delighted to announce the full launch of the entire D7 White Series! Although packaged differently, Snom’s D7 White Series still packs a mighty punch. If you’re in search of a phone that is not only effective but also aesthetically pleasing, this is the Series for you. Check out our Hardware page. The elegantly designed D785 boasts a stunning high-resolution colour screen and a convenient and easily navigable secondary display perfect for dynamic contact management. With features such as Bluetooth connectivity and HD audio quality, the D785 is perfect for any working day. 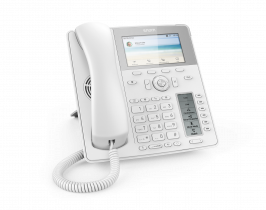 Also known as the world’s first sensor-supported IP telephone, the Snom D735 is a cutting-edge device not only in specs but in appearance. The phone features a high resolution 2.7′ inch colour display screen, 32 self-labelling functioning keys and Digital Signal Processor enhanced audio quality. 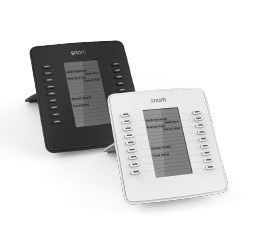 The Snom D715 provides workers with high-speed connectivity, an elegant design and 5 configurable LED function keys. The four-line backlit black and white display provides users with a simple, but efficient user experience. The D715 is the idea IP Phone for those who are searching for an affordable, beautiful and efficient phone. The D7 expansion module provides users with more flexibility and increased productivity. The expansion module, fitted with a high-resolution display, features 18 programmable multicolour LED keys. All IP phones in the D7 range come fitted with a USB port for the D7 expansion model to plug in.